Stone floor tiles can lose their sparkle over time, and the grout can discolour. Fortunately, most types of stone are easy to care for and keep clean with some simple maintenance. The type of stone in this particular project is travertine, so to clean other types of stone, such as marble or limestone, check the product suitability. If possible, contact the original supplier for advice on the correct products to use. Once you have finished deep cleaning, you can follow the instructions on how to seal stone floor tiles. Find more cleaning hints, tips and step by steps on our dedicated hub page. Renovating a house? See our practical guide for all the advice you need. If possible find out what products were used when the tiles were originally laid. Always test new products on an inconspicuous part of the floor first, such as a dark corner. Use products as directions state and wait for a few days before tackling the main floor to check there are no adverse reactions. When cleaning and sealing real stone floors, use a detergent formulated for calciferous stone (travertine, marble or limestone) as general floor cleaner may contain acid that can etch the surface. Dilute detergent with water in a ratio of 1:5 and apply generously with a sponge; use a long-handled squeegee for larger areas. Try a stronger solution if very dirty. Allow the product to work for 10 to 20 minutes, periodically scrubbing badly stained areas. The grouting, being rougher than the stone, is particularly susceptible to ingrained dirt and grease. Experiment with different types of brush – we found a nylon bristled washing-up brush worked very well. Wipe away the dirty cleaner. Rinse with a mop and a bucket of clean water. Go over the stone floor tiles with an old towel to reduce drying time. Once dry, check if the tiles need to be resealed by leaving a few drops of water on the surface. If water soaks in, the floor needs an application of impregnator. Find the best floor mop for tiles in our guide. 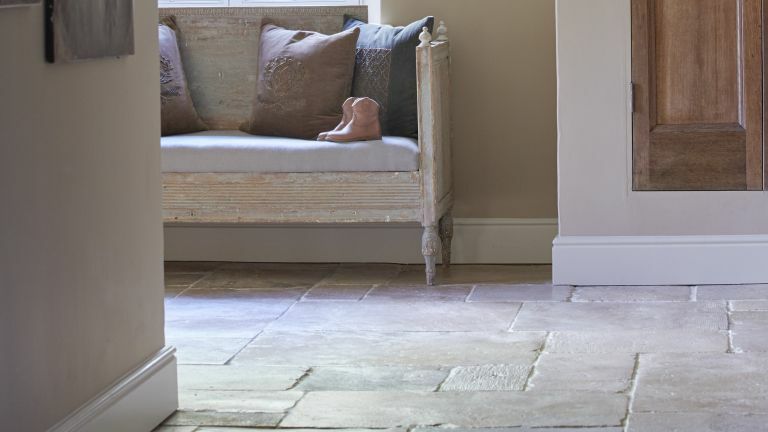 Keep your stone floor tiles looking good for longer by sealing them. Before sealing your floor tiles they must be completely dry. Leave for several days if possible. Working in small areas, apply impregnator evenly with a long-handled foam roller until the surface is wet. Add more as necessary, ensuring the floor is uniformly wet for between five to 15 minutes. The impregnator must be absorbed by the stone. After 15 minutes of application any impregnator remaining on the surface of the floor tiles must be removed and not allowed to dry on to the surface. Remove excess with a squeegee and a clean cloth – a tatty cotton T-shirt is just the job. Check over the whole surface to ensure there’s an even finish. Don’t let anyone walk on the floor until it is dry. This depends on temperature but after one to two hours it should be safe to walk on in socks. Treat the floor with care, don’t cover with rugs, or move furniture about, and wipe up spills immediately. The treatment can take three days before it is fully cured. Sweep stone floor tiles frequently to protect against dirt and mop up spills as they occur. A regular wash with a squeeze of cleaner will prolong the life of the sealant and add lustre. Once a year check the stone for porosity using a few drops of water, and apply protective solution when required.